It is immediately clear upon reading this book that Queen is a straightforward, honest and intellectually pragmatic man who has incorporated military thinking into his thought process. Under And Alone reads like an After Action Report, filled with meticulous detail which is to the point, simply written and is home to some unnecessary profanity ejaculations. Queens casual writing style is enjoyable but also entirely forgettable, writing as he would probably speak in person. The author doesn’t strike me as a particularly talented or intelligent writer – but the content of Under And Alone more than make up for these nearly irrelevant shortcomings. I read Under And Alone in one sitting – it was surely a page turner! You will be brought along on the dark epic journey of Queens transformation from clean cut ATF agent to bearded Mongol gangster. 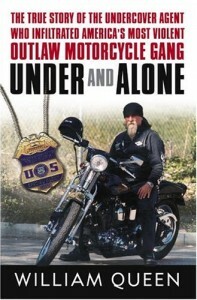 During the authors odyssey he begins to question his loyalties to the bureaucratic, cold and indifferent ATF administration and when his adopted mother dies finds no solace in the latters company, instead siding with his biker brothers who unanimously support him. At several points in the book we readers begin to wonder if Billy St. John, the authors biker alias, has replaced William Queen. While Queen never admits to committing any capital offenses and manages to hang onto his baseline of morality he increasingly becomes estranged from his supposed law enforcement brethren and hints at the possibility of simply fleeing with the Mongols.